Calling all chia pudding lovers! 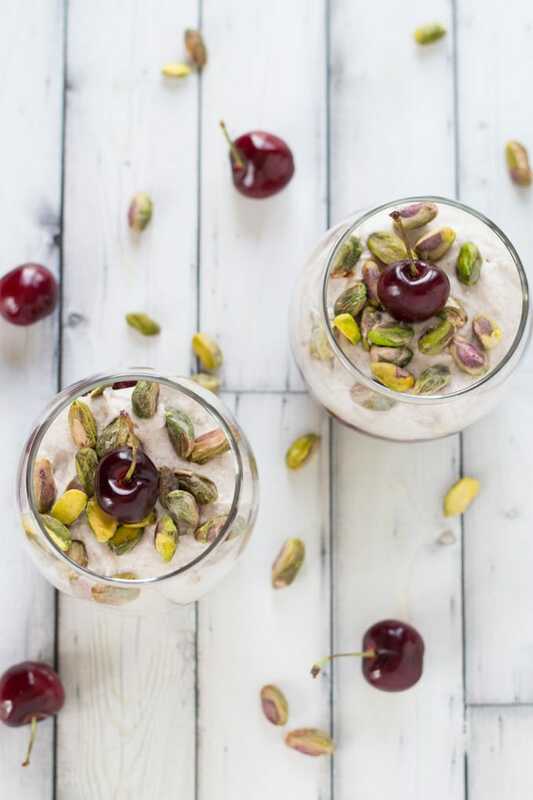 If you enjoy a good chia pudding every now and then, you need to try this Cherry Chamomile Chia Pudding with Pistachios and Coconut Cream! It’s the perfect post-supper or pre-bedtime treat. 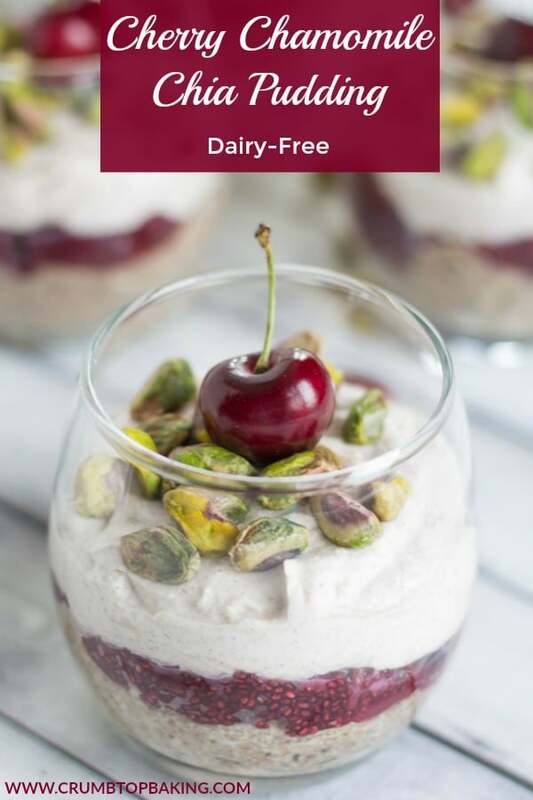 Chia is a great way to fill up and ward off hunger, and this pudding is a delicious way to incorporate chia into your diet! It’s like eating dessert, but it’s totally clean eating! And the bonus? With ingredients like cherries, chamomile and pistachios it might even help you relax and sleep a little better! So cherries are finally in season! And over the past week I’ve gone through two full bags! 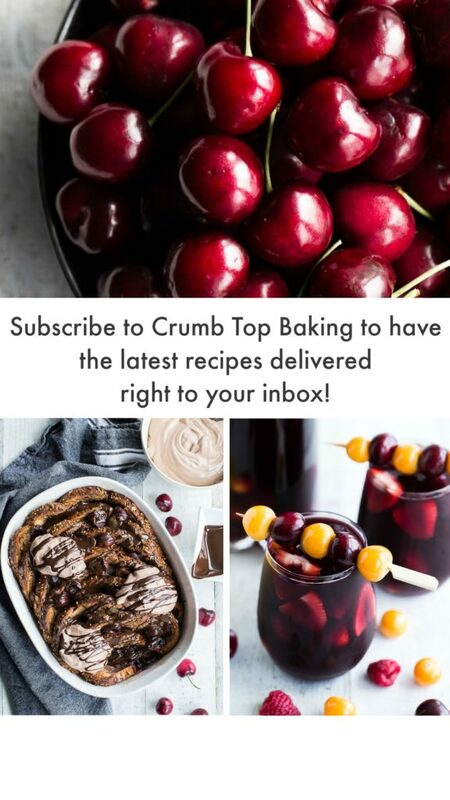 I had a list of cherry inspired recipes that I wanted to try, so it didn’t take long to go through my bulk purchase of cherries. This Cherry Chamomile Chia Pudding was the first recipe on my list, and it didn’t disappoint! (Well, it didn’t disappoint me. Hopefully, you will agree!). If you are new to chia puddings – welcome! You’ve found a good place to start! Even though there might seem to be a lot going on with this pudding, it’s really easy to make. And not only does it make a great snack but it could also be enjoyed as a dessert or even breakfast. This recipe makes four large puddings, so if you make this recipe during your meal prep on Sunday, you can have healthy snacks and breakfasts readily available during the week. The base of this Cherry Chamomile Chia Pudding is almond milk, ground white chia seeds, chamomile tea, honey and coconut. I prefer ground chia seeds in my chia pudding but if you prefer them whole, you can absolutely add whole chia seeds (black or white) to this recipe. Just add the milk, chia, tea, honey and coconut to a bowl and stir until well combined. I’m also not a fan of runny puddings, so I use a lot of chia seeds in my chia pudding. If you don’t like thick pudding, just use less chia! This recipe is totally adaptable to your pudding likes and dislikes! Once mixed together, store the pudding in the fridge for a few hours to let it set. While the pudding is setting up, you can make the cherry chia jam, which is just cherries, water and chia seeds stewed together to make jam! 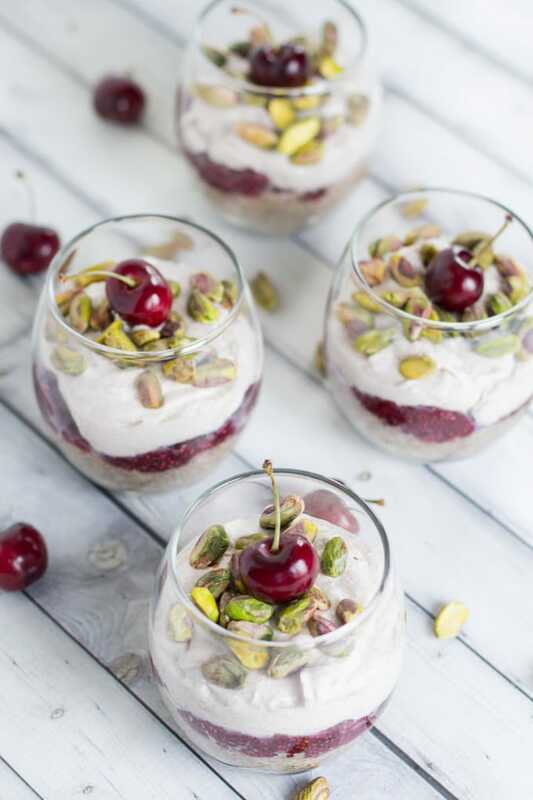 When you are ready to assemble the Cherry Chamomile Chia Pudding, just add the pudding to the bottom of a glass or small mason jar, and then top with jam! Ordinarily, I would top a cherry recipe with chocolate. Because nothing pairs together better than cherries and dark chocolate (okay, maybe peanut butter and chocolate….or coconut and chocolate 🙂 Yum!). But since I’ve been eating this as a nighttime snack, I figured I would forgo the chocolate! But if you were eating this earlier in the day, you could totally add dark chocolate chips or cacao nibs! But……you know I couldn’t just leave the pudding without some sort of topping! Right? So I added some pistachios, which are filling and colourful, and also, apparently, another food that is good for sleep 🙂 . (Is it totally obvious I’ve been googling better foods for sleep?!?). 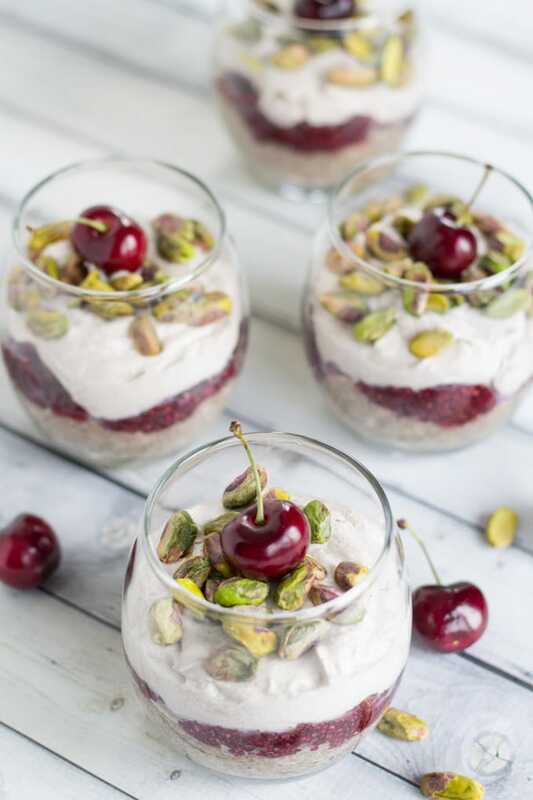 And you might have noticed that there is some coconut cream on this Cherry Chamomile Chia Pudding too! I know, you are probably thinking, does this girl add coconut cream to everything? Yup. These days I pretty much do. There is always some whipped up in the fridge or a can of coconut milk in the fridge waiting to be whipped up! The coconut cream adds a nice taste and change in consistency to the pudding. The cream recipe is the same one I used for this Almond Butter Strawberry Shortcake Tart. The coconut cream is not necessary for this chia pudding recipe, but come on, it doesn’t really hurt! And if you want this pudding for dessert, then the cream is probably a must! Right? 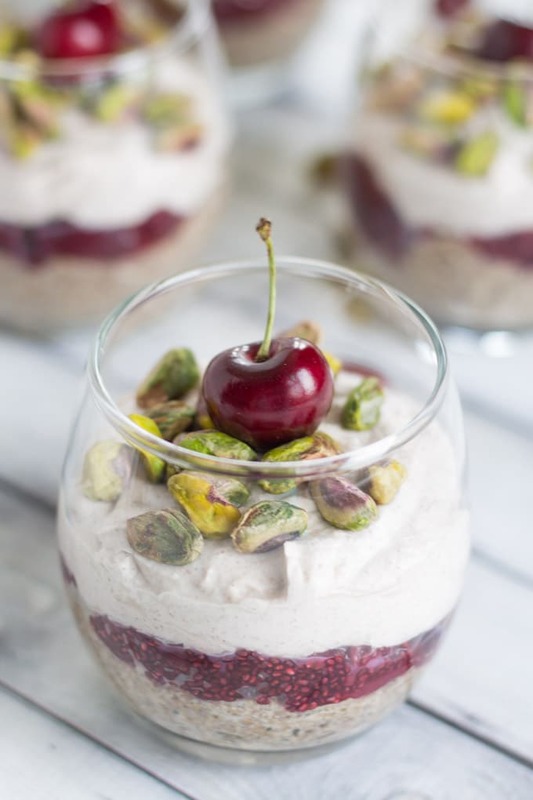 If you are a chia pudding lover, you need to try this Cherry Chamomile Chia Pudding with Pistachios and Coconut Cream! Clean eating and loaded with fibre, this pudding makes a great make ahead snack, dessert or breakfast. 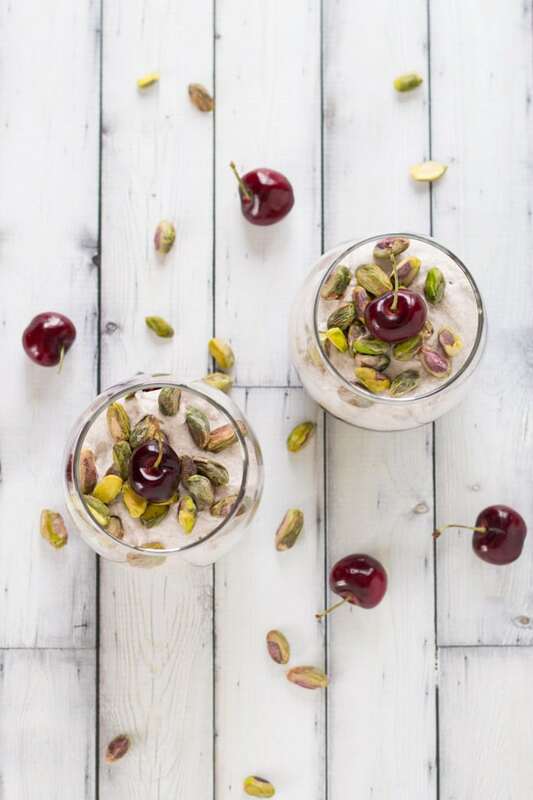 And with cherries, chamomile and pistachios it might even help you sleep! Chamomile chia pudding: In a medium sized bowl, add the almond milk, tea, white ground chia, honey and coconut and stir until well combined. Cover and refrigerate 2-3 hours or overnight, until the pudding has set. Cherry chia jam: In a small sauce pan, add the cherries and water. Bring to a low boil. Cook until cherries start to soften (about 10 minutes). Mash the cherries slightly. It’s okay if there are some cherry chunks remaining. Stir in the black chia seeds and simmer on low for a few minutes. Stir the jam to ensure it does not burn on. Remove from heat and let sit covered for 20 minutes. 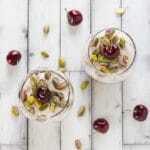 Coconut cream and pistachio topping: To prepare the coconut cream, refrigerate the can of coconut milk overnight. Scoop the solidified coconut milk off the top and add to a bowl along with the maple syrup, cinnamon and almond extract. Beat on high with an electric mixer for 3-5 minutes, or until the coconut cream is smooth. Assemble the Cherry Chamomile Chia Pudding: Divide the chamomile pudding evenly amongst 4 glasses or mason jars. Then, layer on the cherry chia jam, again dividing evenly amongst the 4 glasses. Top with coconut cream and pistachios. Eat immediately or refrigerate for later! The puddings are best if consumed within 2-3 days. If you don’t have ground white chia seeds, you can use whole white or black chia seeds. If you prefer ground chia seeds in your pudding but don’t have any, just add all the pudding ingredients to a blender instead of stirring them together. If you prefer your chia pudding a little runnier (8 tbsp. in this recipe will make the pudding super thick), just use less chia. Thanks Neha! I can’t wait for cherry season so I can start making this again! It’s definitely a nice combo!